Vivid Sydney is my favorite event in Sydney and here is one of photos taken during it. 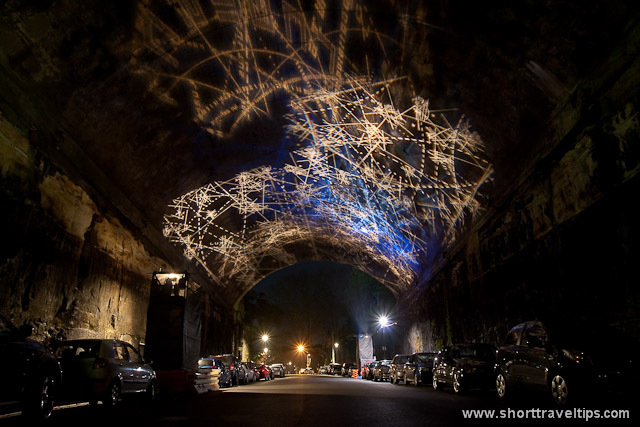 An art light projection re-visioning the iconic Argyle Cut in the heart of The Rocks. Clever design and projection ensures no spill light into the night sky for highly dramatic effect. Looks like a pretty neat event! What a great shot! From the number of cars parked along the roadway, I’d say it’s a popular event to attend! It is close to Rocks district near opera house – very popular place by locals and tourist, so it always a lot of cars around. This is something I’ve never seen before. Very cool! Sounds like a pretty cool event! I like the light patterns. Audrey, you must add this event to your schedule if you’ll go down South.